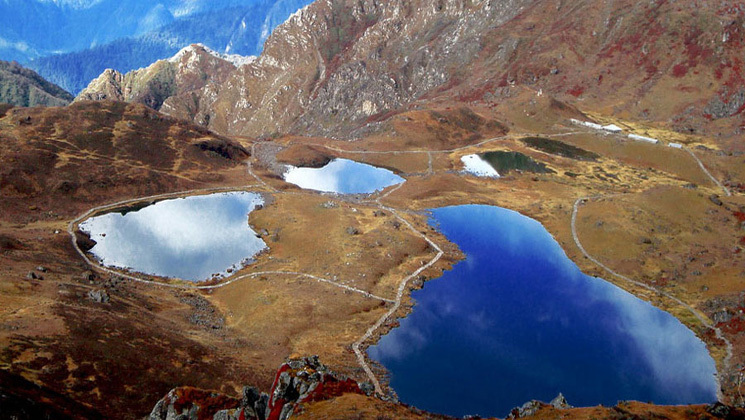 Panch pokhari trekking is commonly known as five different small lakes. Each lakes has each different names and they are derived from Lord Shiva. Panch pokhari trek is sacred – pilgrimage trek often visited by Hindu people. From Panch pokhari, you will have a stunning view of some of the snow-capped mountains such as Dorje Lakpa (6,966m), Phurbi Chhyachu (6,637m), Madiya (6,257m), Rolwaling and Langtang range, Jugal Himal and the charming biological diversities contribute to deserving the trip. Furthermore, the trip consists of the base of the Jugal Himal range in the initial and concludes in the lower part. Trek to Panch pokhari offers several Sherpa and Tamang settlements and cultural factors of their lifestyles and incredible hospitality. Moreover, sacred Panch pokhari trek passes through some beautiful and interesting villages and you might see some of the wild animals such as Musk deer, Himalayan black bear, Monkeys, Himalayan wild goat and particularly birds and wildflowers along the routes. Besides that, Panch pokhari trek is the tranquil eternity and dotted by the colorful rhododendron forest, which is extremely spectacular in the spring season. Thus, Panch pokhari treks is not a very difficult trek and you can trek at any time throughout the year. It is a classical trek itinerary compared to most walks in this region leading up to the sacred 5 ponds hill station. The particular route is designed for the world traveler who wishes to trek in a more relaxed manner than take a look at this itinerary. Upon arrival in Kathmandu, Tribhuwan International Airport, we will receive you with private vehicle and transfer to hotel in Kathmandu with breakfast plan. Our representative will give you information about further programs. Day 2 World Heritage sites of Kathmandu Sightseeing, 6 hours. In the morning after breakfast, we start our day trip visiting world heritage sites located in Kathmandu city which includes Boudhanath stupa (also known as the oldest stupa of Nepal), Pashupatinath temple (holy temple of Hindu where cremation takes place by the holy river Bagmati), Later we visit Kathmandu Durbar Square and Syambhunath Stupa. And transfer to hotel. After breakfast, we meet the crew and drive together to Chautara. Chautara is the headquarter of Sindupalchok district where we fix out camp tonight. From our campsite you can relax and enjoy the stunning mountain views, or if you like to explore, you can gain some insight into the culture and daily life walking to Gidane village where we supported many projects after the earthquake disaster. Our journey goes gradual uphill walking to reach Sano Okhareni. Our path passes through small villages where we can see how the diverse ethnic groups live side by side. We camp at Sano Okhareni near a pine forest and with great views to the mountains. We walk gradual uphill walking to Thulo Okhareni. From here we get into the steeper climb with some hours walking through stunning, dense Rhododendron and pine forest. If we are lucky and observant, we might spot some wild animals such as mountain deer or langur monkeys and Nepali birds life like the danfe (Impheant pheasant). Tonight we camp on a summer pasture ground for nomadic cattle herders (kharka). Today’s walk is nice and gentle, being fairly level (‘Nepali flat’) and we can enjoy our forest trails and wildlife spotting. We walk through the lush forest of rhododendron, oak, pine and juniper and we can see some nomad’s houses for cattle on the way. In Pauwa Bas there is a shelter for pilgrims to Panch Pokhari. This morning we have a steep uphill to get tophill than we get our breath back on the steep downhill though as we descend for 1 ½ hours through the forest. We have some great mountain views on our way down into our camp at Hille Bhanjyang. We take it easy on the steep uphill section to start the day, taking about an hour. Then we enjoy the gradual descent of about 3 hours through rocky hills and rhododendron forest into camp at Narsim Pati. There is a small rest house for pilgrims on their way to the holy site of Panch Pokhari and we have great mountain views from our campsite. Today we walk some hours of gradual ascent through rocky hills to reach our destination of Panch Pokhari (panch means ‘five’ and pokhari means ‘lake’). This stunning setting is a secluded pilgrimage site where the Janaipurnima festival is held in August. Many Hindu and Buddhist pilgrims visit this site each year and we can see two pilgrim houses and the temple dedicated to Lord Shiva. This morning we have an early start to catch a stunning sunrise over the mountains! We have about 1 ½ hour uphill to see the beautiful sight of the sun rising over the Himalayas and our panoramic view includes Mt.Dorje Lakpa, Jugal Himal Range, Rolwaling Range, and Langtang Range. After this incredible start to the morning, we head back down to Panch Pokhari to pack up and start heading for home. We walk downhill some steep trails through the rhododendron forest to Tupi Danda (danda means ‘ridge’) and our camp. Today we walk through terraced fields to the beautiful village of Dhap. Dhap is home to Tamang families and is gives us a great chance to gain some insight into the lives, culture and traditional architecture of Tamang villages. We walk down through terraced fields, along the Indrawati River. We pass through stunning villages and also see a hydroelectricity project on the way to Tipini and our re-introduction to a road! Melamchi Pul Bazaar lies at the bank of Melamchi Khola (stream) and Indrawati River is comparatively a big town for this area. There are some lodges, tea shops, government offices, schools, colleges, post office, and army police camp. You can refresh yourself with a dip in the river. Discover some of the tallest Mountains and colorful rhododendron forest (Spring). Walking through cultivated fields, colorful Rhododendron, conifers and oak forest. Experience the Sherpa and Tamang villages and their life styles. How much does Panch pokhari trekking cost? This trek is available now on USD 1,399 per person is standard trek price on double occupancy basis. In this price, we offer you Tourist Standard accommodation in Thamel, Kathmandu and of course the trip price will vary according to group size. Kathmandu – Chautara and from Melamchi Bazzar to Kathmandu transfer by bus. Professional and experienced cook and other kitchen helper according to the group size. Any kinds of battery charges, laundry service, phone calls …etc. We can organize private Panch pokhari trekking starting at any date that works for you. Please contact us for more information. Question: Do I need the experience to do Panch pokhari trekking? Answer: No ! But if you can walk about 3 hours each day with a lightweight day pack would be easier. Question: What kind of accommodation can I expect on Panch pokhari trekking? Answer: We provide you tourist standard accommodation in Kathmandu and you will have Tented camping accommodation along the routes. But you need to take your own sleeping bags if you have one with you otherwise, you may rent it while you are in Kathmandu. Question: What opportunities will I have for a shower along Panch pokhari trekking? Answer: As you are doing camping trekking, we provide you hot water bucket then you will take a bucket shower. Question: How do I get drinking water on express Panch pokhari trekking? Answer: In some places, you can buy bottled mineral water to drink but we advise against buying mineral water in plastic bottles, as currently there are no provisions for disposing of these. Instead, we provide you chlorine tablets to purify the normal water as the normal water is available in campsite/along the way. Question: Can I charge my digital camera or other batteries on my Panch pokhari trek? Answer: In Tented camping trekking there is very very less chance to charge the battery. We recommend you bring an extra pair for in case. Remember to bring your own adapters!. Question: Is there any communication facilities on Panch pokhari trekking? Answer: Yes ! Sometimes you can get telephone services as well as internet, so buy a local SIM card. Question: Can I use credit cards in Panch pokhari trekking? Answer: No!. To maintain your daily expenses on trek you need to bring all in cash Nepali rupees because credit cards work only in the bigger cities. Question: Who will carry my luggage on Panch pokhari trekking? Answer: We provide porters to transfer your luggage. As we are a responsible trekking tour operator agency, each of our porter carry maximum 25 kilo of your backpack which means 2 guests (12.5 kg luggage of each guest): 1 porter basis. However, Ganja la pass trek is challenging trek so each of our porters can carry a maximum of 22 kg of your belongings. If you wish to have a private porter, you might also get it on paying an extra cost. Trek to Panch Pokhari itinerary is subject to change due to a condition beyond our control. This is a Guideline showing tentative camp night stops. Physical, technical and natural condition may change this above itineraries. Opportunities for challenging trekking strolls are scattered all over this planet; you just need to know where to find them. We at Gokyo Treks and Expedition believe in the quality services. Your safety and satisfaction is our concern. We are a team of professional, experienced, well trained and licensed local guides who know the destination much better than others.